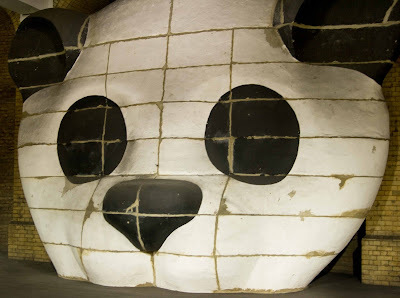 Fresh eyes on London: Mickey or Panda? Mickey Mouse in the underground. Or maybe its a giant panda. What do you think? Panda or Mickey? I would say panda as well! what an interesting painting! Andy Panda would be my guess. this is definitely a panda. I think Mickey's face is a flesh tone. He also has an oval nose. but they're close! Maybe they're cousins? panda. i saw this last month, where is it again? somewhere on the piccadilly line..
Actually, it reminds me a bit of the Phantom of the Opera.